Heirloom grains. With wheat on the outs and quinoa overplayed time to try something new. How about spelt? Or teff, the grain used to make that amazing Ethiopian bread. Quinoa. I had this on my "out" list last year, but it just wouldn't go away. Sure it's good for you, but so are lots of other grains and it's time to give them a chance. Korean cuisine. Japanese food is everywhere. Pok Pok and Little Serow have patrons lining up for hours to eat Thai. Mission Chinese Food is a hit. Time for an enterprising chef to bring Korean to stage center. Sriracha. With the American producer of this popular Asian hot sauce shut down (hopefully temporarily), it's as good as time as any to give another flavor a try. Small-batch whiskey. Small-scale distilleries that got into the game making gin are branching out, and whiskey feels like a logical place to go next. Bring on the brown cocktails! Small-batch gin. Been to the gin shelf of a liquor store lately? That place is crowded with "American dry gin," which is now made all over the country. Creative desserts. The cronut was just the beginning. I expect we'll see other such buzz-worthy confections in the new year. Cronut. As I said, time for something else to obsess over and wait in line for hours to taste. Umami. Forbes includes this on its trend list, and I have to agree. Perhaps by the end of 2014, dashi will be a household word. Sweet. It's the flavor that's the easiest to like, but thus also the easiest to overdo. Too often dishes that don't need sugar have it. Time to ease up. Savory cocktails. I've been thumbing through Greg Henry's book, and judging from this and the drinks I've been enjoying in bars lately, there's even more libation experimentation to be had. 19th Century cocktails. It's been a great history lesson, but there's a whole new world of flavors there. Time to look forward. Cauliflower. 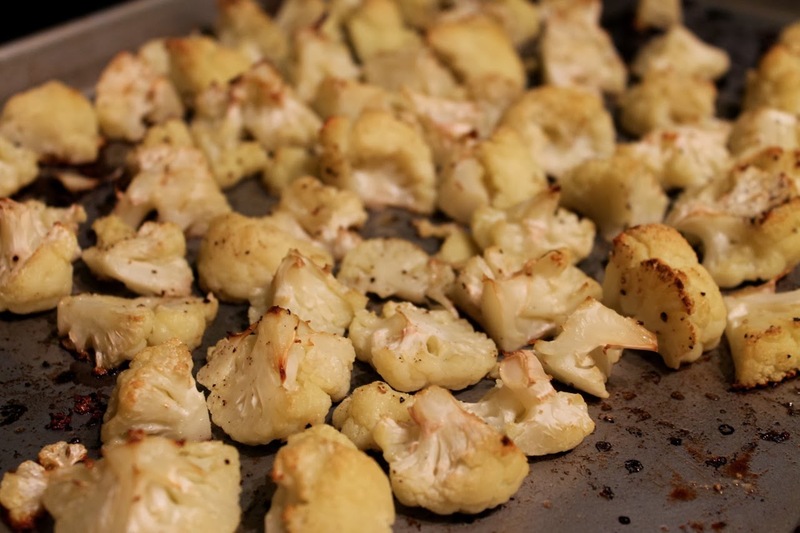 You can do so much with cauliflower. Roasting it really unlocks its flavor. Kale. Another thing I thought would cool off this year that really didn't. Aren't we all a little tired of kale salad by now? Midwestern cuisine. It makes sense, doesn't it, that the region closest to where so much of our food is grown would have some interesting things to say about fresh and local. A lot of people are saying this is the next big thing. BBQ. Who doesn't love a good hunk of smoky meat? Well, I suppose vegetarians, but BBQ junkies (including moi), surely got a good fix this year. Time for something else from the heartland. Ice cream. Exciting ice cream flavors are all the rage, whether slowly churned or made instantly. Cupcakes. Tired of the frosting nose. Caring for your micobiome. Turns out the bacteria we each carry around in our gut is important, very important, to maintaining good health. Fad diets. Have you lost weight with Atkins, South Beach, Paleo or any other such fad diet and later gained most or all of it back? I think Michael Pollan got it right when he said "eat food, not too much, mostly plants." Want to check out last year's In/Out list for 2013? Here it is. How'd I do? A lot of things I said would be "out" are still very much "in," although I think I got it right with gastropubs. And it's possible my declaring Scandinavian cuisine "out" foreshadowed Noma getting knocked from its "best restaurant in the world" perch last year. And saying bread courses was "in" was a good call: Le Diplomate, which opened a few months later, serves an amazing one. As does Commerce in New York's West Village. What do you think of this year's list? Let me know in the comments. I'm cool with "midwestern" cuisine and "savory cocktails" being in, but how can kick "sweet" to the curb? Does that mean I'm out?